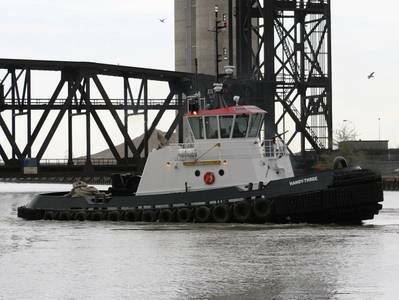 A newly constructed tugboat, HANDY-THREE, is to be ceremoniously named at Great Lakes Shipyard, Cleveland, Ohio, on Wednesday, May 2, 2012. The tugboat has been sold to Puerto Rico Towing & Barge Co. of San Juan, Puerto Rico. Congresswoman Marcy Kaptur, Representative of Northern Ohio’s Ninth Congressional District, will be the Sponsor and Principal Speaker for the tugboat HANDY-THREE. The vessel is the third of a class of Handy Size tugboats designed by Jensen Maritime Consultants, Seattle, Washington. Specifically for harbor and coastal towing, the “HANDYSIZE” Class fills the market niche in the 2,000 - 4,000 horse power tug market for harbor work, fireboats, and construction operations as well as for coastal barge towing. The Great Lakes Shipyard, a division of The Great Lakes Towing Company, has a full-service shipyard with a 770-ton Travelift and a 250-ton dry dock. The Company is currently in the fourth and final phase of its Shipyard Expansion Project which is to be completed by July, 2014. The Great Lakes Towing Company operates a fleet of over 35 tug boats throughout the Great Lakes. The Great Lakes Towing Company and Shipyard prides itself on a legacy of over 113 years of continuous business.